AFTER John Nash laid out Regent Street and the grand terraces beside Regent’s Park, he created one of London’s first suburban villages a mile further north. The villas there, built between 1823 and 1834, are all different and never in line with their neighbours. Detached and semi-detached, symmetrical and asymmetrical in their design, they are a beguiling mixture of Classical and Gothic, each with its own private garden. Behind a turreted semi-detached villa lies one such garden: step through a wirework arch covered with dark-blue clematis and you walk into a different world. Traffic noise is deadened by tall trees and the only sound is the crunch of gravel beneath your feet and the splashing of water down stepped ponds. 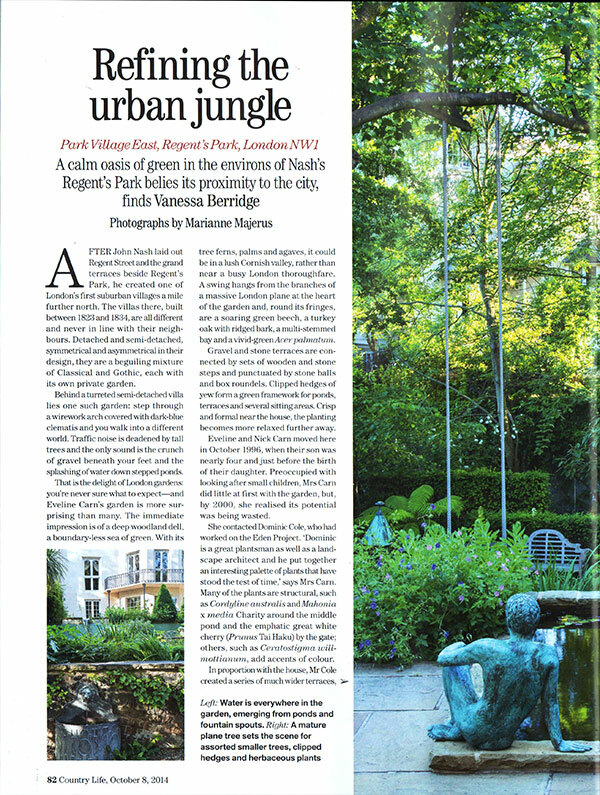 That is the delight of London gardens: you’re never sure what to expect—and Eveline Carn’s garden is more surprising than many. The immediate impression is of a deep woodland dell, a boundary-less sea of green. 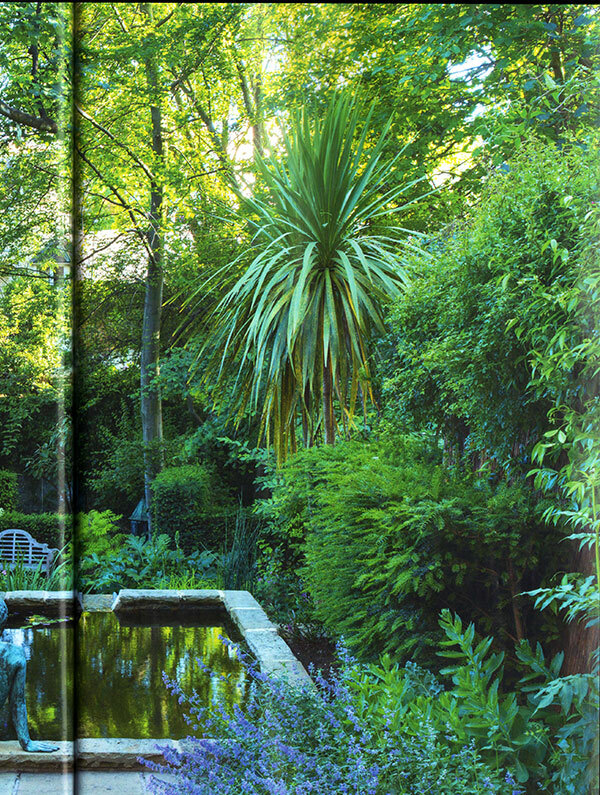 With its tree ferns, palms and agaves, it could be in a lush Cornish valley, rather than near a busy London thoroughfare. A swing hangs from the branches of a massive London plane at the heart of the garden and, round its fringes, are a soaring green beech, a turkey oak with ridged bark, a multi-stemmed bay and a vivid-green Acer palmatum. Gravel and stone terraces are connected by sets of wooden and stone steps and punctuated by stone balls and box roundels. Clipped hedges of yew form a green framework for ponds, terraces and several sitting areas. Crisp and formal near the house, the planting becomes more relaxed further away. Eveline and Nick Carn moved here in October 1996, when their son was nearly four and just before the birth of their daughter. Preoccupied with looking after small children, Mrs Carn did little at first with the garden, but, by 2000, she realised its potential was being wasted. She contacted Dominic Cole, who had worked on the Eden Project. 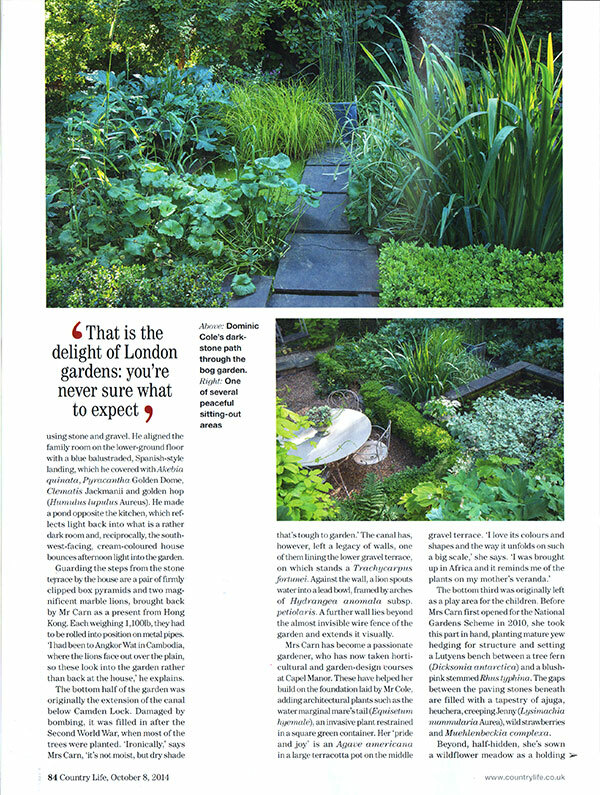 ‘Dominic is a great plantsman as well as a landscape architect and he put together an interesting palette of plants that have stood the test of time,’ says Mrs Carn. Many of the plants are structural, such as Cordyline australis and Mahonia x media Charity around the middle pond and the emphatic great white cherry (Prunus Tai Haku) by the gate; others, such as Ceratostigma willmottianum, add accents of colour. In proportion with the house, Mr Cole created a series of much wider terraces, using stone and gravel. He aligned the family room on the lower-ground floor with a blue balustraded, Spanish-style landing, which he covered withAkebia quinata, Pyracantha Golden Dome, Clematis Jackmanii and golden hop (Humulus lupulus Aureus). He made a pond opposite the kitchen, which reflects light back into what is a rather dark room and, reciprocally, the southwest-facing, cream-coloured house bounces afternoon light into the garden. Guarding the steps from the stone }terrace by the house are a pair of firmly clipped box pyramids and two magnificent marble lions, brought back by Mr Carn as a present from Hong Kong. Each weighing 1,1001b, they had to be rolled into position on metal pipes. `I had been to Angkor Wat in Cambodia, where the lions face out over the plain, so these look into the garden rather than back at the house,’ he explains. The bottom half of the garden was originally the extension of the canal below Camden Lock. Damaged by bombing, it was filled in after the Second World War, when most of the trees were planted. Ironically,’ says Mrs Carn, It’s not moist, but dry shade that’s tough to garden.’ The canal has, however, left a legacy of walls, one of them lining the lower gravel terrace, on which stands a Trachycarpus fortunei. Against the wall, a lion spouts water into a lead bowl, framed by arches of Hydrangea anomala subsp. petiolaris. A further wall lies beyond the almost invisible wire fence of the garden and extends it visually. The bottom third was originally left as a play area for the children. Before Mrs Carn first opened for the National Gardens Scheme in 2010, she took this part in hand, planting mature yew hedging for structure and setting a Lutyens bench between a tree fern (Dicksonia antarctica) and a blush-pink stemmedRhus typhina. The gaps between the paving stones beneath are filled with a tapestry of ajuga, heuchera, creepingJenny (Lysimachia nummularia Aurea), wild strawberries and Muehlenbeckia complexa. Beyond, half-hidden, she’s sown a wildflower meadow as a holdingoperation while she decides what to do in this especially shady spot. Beneath the bay, Acer palmatum and Lonicera nitida Baggesen’s Gold a raised side bed, Mrs Carn has recently planted ferns, arum lilies, box, euphorbia, phormium and the Japanese grass Hakonechloa macra Aureola to provide contrast to the strong architectural shape of the other plants. The white-tipped grass, Melica altissima Alba, a Chelsea-inspired idea, is dribbled through for softness and movement. 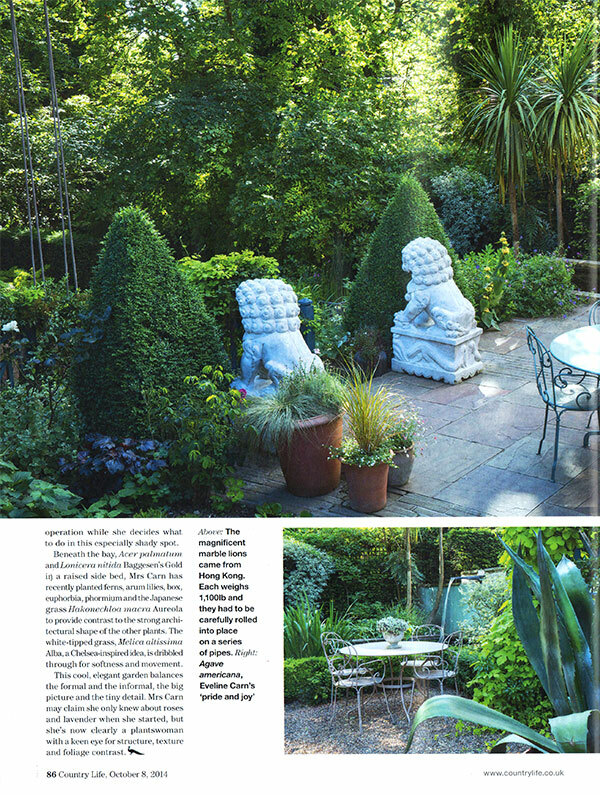 This cool, elegant garden balances the formal and the informal, the big picture and the tiny detail. Mrs Carn may claim she only knew about roses and lavender when she started, but she’s now clearly a plantswoman with a keen eye for structure, texture and foliage contrast.